An introduction to the bizarre world of Japanese confectionary. White Rabbits: Creamy Candies. One of my mates brought my attention to these, I was wary at first since this is the man who eats Durian fruit for kicks. But I dutifully marched up to Chinatown and bought some. Unwrapping one leads to a slightly confusing moment as there is this odd film over the sweet which looks like it should come off, it doesn't. It's like a blob of very chewy condensed milk with a not too unpleasant plastic lychee aftertaste that sticks to your teeth, I mean it really sticks to your teeth, I was picking that stuff out for a good hour. I am not a sweets kind of guy, but oddly kept coming back to these. white rabbit candies are from China. and you can eat the film too. 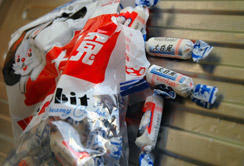 growing up, we used to eat these candies all the time. they are the best candies in the world. Hi, I used to eat White Rabbits when I was a kid. And after (what?) 35 years, the wrappers are still the same! I wasn't that keen on the sweets but really liked the 'odd film', which is made from rice. Kind of tasteless but I liked the way the rice paper disintegrated in the mouth. BTW, White Rabbits are Chinese, not Japanese, if my memory serves me correctly.